AirAsia, the World’s Best Low-Cost Airline for 10 years (according to Skytrax World Airline Awards, July 2018) has sparked a revolution in air travel with more and more people in the Philippines choosing AirAsia as the preferred choice of airline. 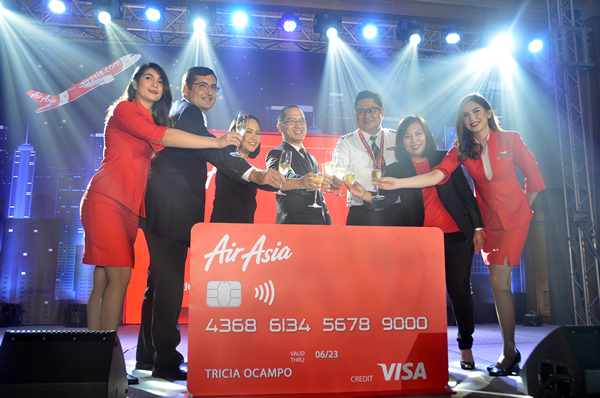 Aiming to create excitement among Filipinos, the airline company, in partnership with RCBC Bankard and Visa has launched the new AirAsia Credit Card in the Philippines that will make more people travel to their dream destinations faster with the airline. Along with their loyalty program, AirAsia BIG Loyalty will enable AirAsia Credit Cardholders to enjoy the lowest flight fares across AirAsia’s extensive network. AirAsia Credit cardholders get to enjoy exciting perks and privileges every time they spend with their AirAsia Credit Card. Starting with a fantastic Welcome bonus gift of up to 8,000 BIG Points that will start them earning free flights when booking during the Final Call Sales, instant upgrade to the BIG Platinum membership status and Free Priority check-in, boarding and baggage every time they fly with AirAsia, and, don’t forget a brilliant low spend per point conversion at Php 22. AirAsia BIG Loyalty was established in November 2011 and is owned and operated by Think BIG Digital SdnBhd, a subsidiary of AirAsia Bhd in collaboration with Aimia Inc. As the loyalty programme for AirAsia, AirAsia BIG Loyalty enables its members to enjoy the lowest flight fares across AirAsia’s extensive network. More than 18 million AirAsia BIG Loyalty Members can earn AirAsia BIG Points on AirAsia flights to over 130 destinations across Asia, Australia and New Zealand and the Middle East, participating hotels as well as retail, e-commerce, travel and lifestyle partners within the region. The loyalty programme makes all seats redeemable by utilising AirAsia BIG Points. Other member-exclusive privileges include 24-hour priority booking for selected AirAsia sales.